Now, it's easier than ever to find exactly the Suzuki Samurai parts you need to get your little pocket-rocket back up and running. Let's face it, people who purchase the Suzuki Samurai aren't taking their vehicles off-road. They simply enjoy having a reliable car to get them around. But sometimes, even the most reliable car needs some help. Whether you own a Suzuki Samurai or you run an auto repair shop and you have one in the shop for repair, having the exact Suzuki Samurai parts that you need will help get the job finished and the car back on the road. That's why having access to one of world's largest networks of parts suppliers is so important. With the number of suppliers associated with UNeedAPart.com, you can rest assured knowing that finding the Suzuki Samurai parts you need is just a few mouse clicks away. UNeedAPart.com has over 7,000 parts suppliers within our network, easily making us one of the world's largest and most frequented parts locator services. Simply follow the easy menu of choices on the website and you will be instantly matched up with parts suppliers who have the new and used Suzuki Samurai parts you need in stock. We can even locate model-specific parts like the Suzuki Samurai rear seat for a particular model. Best of all, anyone can utilize the strength of selection at UNeedAPart.com. From the home-based repairman needing a windshield wiper to the professional mechanic needing a Suzuki Samurai motor to the auto body shop looking for Suzuki Samurai body parts, UNeedAPart.com makes locating your parts fast and easy! Try us today and see the difference true selection makes. 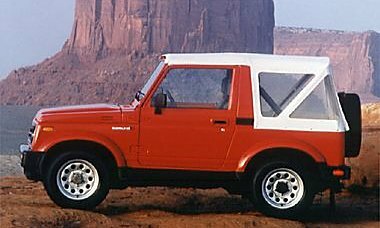 Finding the right Suzuki Samurai parts is easy! To get started, simply use the Parts Request boxes at the top and/or side of the page. You will instantly be matched with auto parts dealers that meet your search criteria. UNeedAPart.com helps you find the new or used auto body parts you need in no time!